I got a question from someone the other day who just launched her business. She was interested in knowing how to get feedback from trusted sources on her initiatives. It’s a good question. In addition to using the standard consumer research techniques, my advice was this: create an advisory board. I am not talking about how to create a board of directors. That has financial and governance responsibilities. Rather, we’re talking about how to create an advisory board. An advisory board is a group of individuals that can give you good advice, coaching and connections…for free…on topics where you need help. I write this from the perspective of someone who serves on advisory boards. I have seen the benefits first hand. This idea applies whether you’re starting out or are already established and looking to get to the next level. The only difference is the skills of the people that you will need to tap as your business grows. It is also relevant for both profit and non-profit organizations. They are a source of new ideas and diverse perspectives. Advisors provide feedback on programs you want to start or issues you are working on. They connect you and advocate for you with people and organizations that can be helpful to you. Advisors give you added credibility depending on how well they are known in their field. It is a pool of people to tap for an opening in your (future) board of directors. If they don’t serve you well on an advisory board, they won’t serve you well on the board of directors either! They don’t do the work for you. Remember, they are not paid. They may be able to take the lead on a project for you on an as-needed basis, but that is not their purpose. That said, I do know that some advisory boards have paid members, especially if they are being asked to support a “hot” technology, but I do not have experience with serving on this type of board. They also do not have the authority to make decisions for your business. While we are calling this an advisory board, you could choose this to call this your advisory team or advisory group. It’s your choice and call to make. What’s important is that you have access to individual members or the group as a whole when you need input. Sounds good, Miriam. 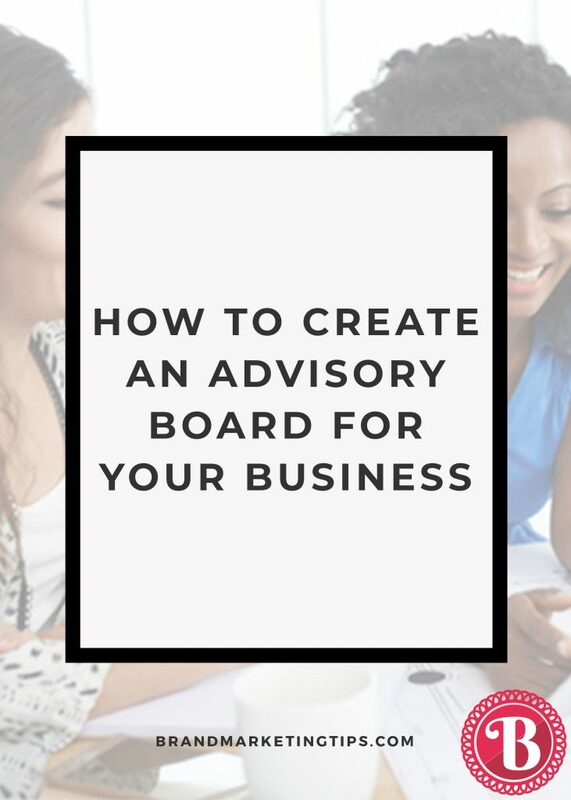 So, how do I get started and create an advisory board for my business? What types of skills, experience, and connections would be helpful to you? It could include functional expertise (e.g., marketing, manufacturing) or specialized subject matter knowledge (e.g., exporting/securing government contracts) or community-based roots. Come up with your pitch. The people you approach are going to be very busy people. You need to give them a compelling reason to spend time supporting you. They have to believe in your vision. Show them your passion and commitment to the service/product/non-profit entity you’re launching or growing. Describe fully your expectations. What do you want them to do for you? How often will you be tapping them for advice? Remember, it’s a non-paid role they are agreeing to take on. Also, if you are going to share confidential information with them, I would highly recommend you ask them to sign a Non-Disclosure Agreement. Come up with a list of people you’d like to approach. Ask for suggestions from people you know, and from an industry association you belong to. Mix it up. All research shows that diverse groups are more creative and productive. So, don’t fill the advisory board with your friends/people like you. Get people who are likely to challenge your thinking. That is what will make you better. Personally invite them. Relay the mission/vision with your passion for your organization and why you chose them. I recommend you try to get three advisors to start. You will likely need to reach out to at least ten people in order to get to the three. You can then add more and switch it up as you need to. I would personally recommend having a maximum of six to eight advisors at any one time as your business matures. Respect their time. Hold at most quarterly meetings or conference calls. Have an agenda that fits the time available with the most important topic to you first. 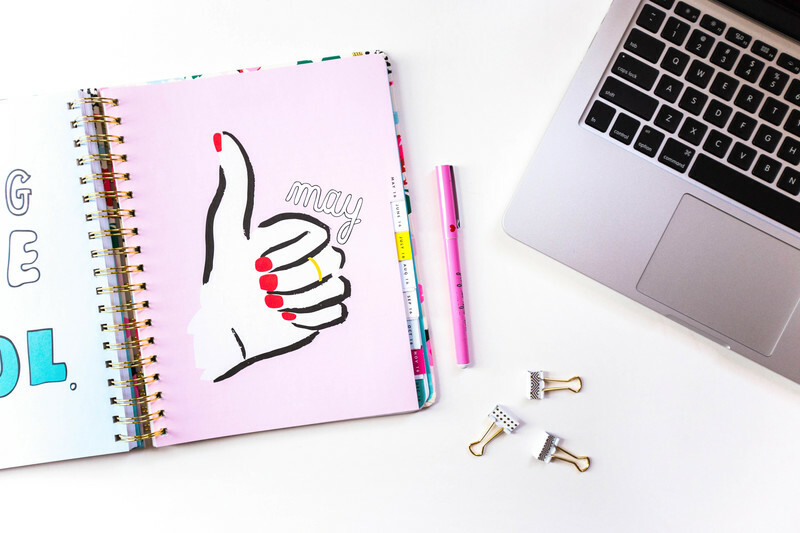 Poll them for the best meeting time using a scheduling tool like Doodle. Or, you can just do one-on-one meetings if that suits you and the rest of the advisory board members best. Recognize them. Promote the advisory board on your website. It helps your image and theirs too. As you add members, you can also promote the additions. Setting up an advisory board is not the single answer to success and there is not one formula that works best. But it can be a positive enabler to set up your organization for growth. Please share your thoughts/questions/comments on how you might create an advisory board of your own down below. What are your experiences with either creating or serving on an advisory board that you’d like to share with our community? Want to read more from Miriam and Lucy? Our first book, The Marketing Plan Blueprint, The 8-Step Process for Growing Innovative Ideas into Winning Businesses, is now available in print worldwide! 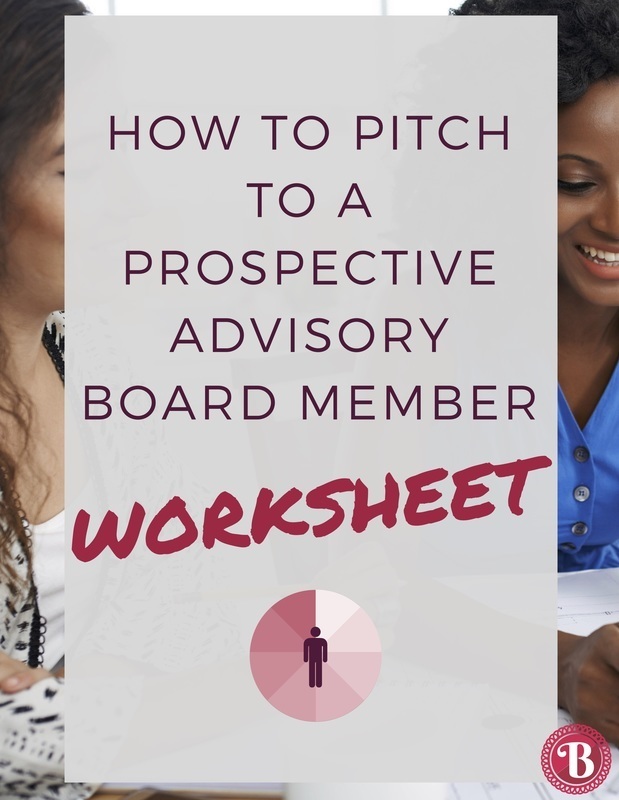 Get the 5 step worksheet we recommend our clients to use when pitching a prospective advisory board member. You'll learn how to identify the skills and people you'll need for success–plus how to nail your pitch and set expectations for board members.